Bed bugs are best described as tiny, six-legged mostly nocturnal bugs that primarily feed only on blood. Usually they feed on the blood of humans or warm-blooded animals. The most common bed bug, (known as Cimex lectularius), is the breed of bed bug most commonly encountered and adapted to living with humans. Adult / full grown bed bugs are mahogany / brown to red in color and oval in shape. At the start or onset of a bed bug infestation, bed bugs are normally found only mattresses, or bed covers. If the area is heavily infested, bed bugs can be found in many holes or crevices like headboard, night tables / night stands, or even in the bedsteads. The typical life cycle / growth stages of a bed bug are: Egg, Nymph, and Adult. The female bed bug can typically lay around 400-500 eggs (up to 5 per day), in holes and crevices in a floor or bed. Freshly hatched bed bugs begin feeding immediately upon birth. They can shed their skin up to five times before becoming adults. Under typical conditions and with an adequate food supply, bed bugs will typically have a life span up to 316 days. One of the most common symptoms of a bed bug infestation are suspicious bites on a person who has slept in an infested bed. These bites appear in groups or clusters of three and are commonly located on the sleepers arms, legs, or other appendages. These bite patterns are a reaction of fear from bed bugs. If a bed bug is in fear of being caught, they will hastily move to a different part of your body to feed. At the start or onset of a bed bug infestation, bed bugs are normally found only mattresses, or bed covers. If the area is heavily infested, bed bugs can be found in many holes or crevices like headboard, night tables / night stands, or even in the bedsteads. 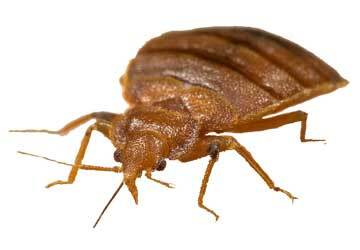 A bed bugs typical diet mostly consists of human blood. They obtain this by puncturing the skin with a long tube like beak and drawing the blood out into their stomachs. Their typical meal time is at night, but if they are really hungry, they feed during the day if the light is dim enough. In private homes, search for any area that bed bugs hide in during the day time. It is vital that these areas be treated with chemicals. In commercial or multi-home establishments, bed bugs can spread from one unit to another using anything from pipes, or wires as a source of travel. Bed bugs are normally discovered in areas such as small holes, crevices, floor cracks, under rugs or carpets, behind loose or aged wallpaper, in magazines or books, CDs, and even electrical outlets. At Whats Bugging You, our unique solutions offer guaranteed results. Our solutions combine a vast amount of knowledge and understanding of bed bug biology, lifestyles, dwelling habits, and behavior,and the use of state of the art pesticides to eliminate and prevent bed bug outbreaks. We constantly update and review the best solutions for effectiveness to bring our clients the best services available. We have a team of dedicated bed bug eradication experts trained to eliminate any bed bugs problem you may have! Contact us today to stop your bed bug problem in its tracks!